Elton John had part of his sixtieth birthday celebrations yesterday in the Episcopalian Cathedral Church of St 'John' the 'Divine' (someone's having a larf!) in Harlem, New York. 450 guests turned up for the £1 million bash. I wonder if it was in the sanctuary? This got me thinking. We have a fab venue for concerts, ceilidhs and parties. Celebs would be most welcome to hire our facilities! That won't work though - Elton offered his guests 2,000 bottles of £200 rose champagne, and we don't allow alcohol on the premises (as a help to those who struggle with it), so I can't see many celebs taking us up on the offer of a venue. Just send those celebs round the corner. We're serving champagne on Easter Day, so a few extra bottles of pink fizz won't be a problem. With regards to ceilidhs, any friends from St Silas who would like to join in with a ceilidh at St Mary's Cathedral to celebrate the risen Lord are most welcome. Dancing starts about 7.30, after Evensong on Easter Day. Hey, there's some great ideas here. Champagne on Easter day? La de dah! Gadgetvicar, -we- could publicise that we're serving booze: it would let people see that we weren't quite so uptight about having fun! Amazing PR don't you know...And I know I'm right when I say that what The Church needs more than anything is some good PR, dear! Added to that,it would be guaranteed attract more alcoholics into the church! Isn't that what we want? The more the merrier: that's in the bible somewhere, yes? 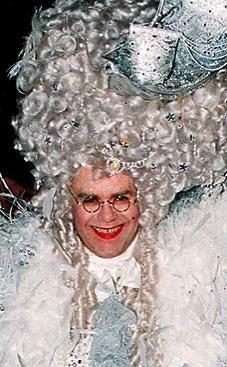 Extravagant Elton is such a great role-model for us all.